In this post, I wanted to tell you about living in Elephant and Castle based on my own recent experience. I lived in Elephant & Castle for more than a year and I still often return to the area to visit some great trendy places like Mercato Metropolitano (read my post about the best things to do in Elephant & Castle area). Is Elephant & Castle safe and what are the main safety tips for living in Elephant & Castle. Is the crime still there or is it one of the new trendy districts to live in London? Keep reading and you will find out! Is Elephant and Castle safe? Is Elephant and Castle safe? If you asked me the same question 7 years ago, I would have probably said yes. I had an opportunity to visit London for a month in 2011 and was based in Cutty Sark, Greenwich back then. Until I moved to Elephant & Castle in 2017. Now how did that happen? Yes, now we are living in Elephant and Castle in London. Before we used to live in Edinburgh, Scotland. In the last 7 years, however, Elephant and Castle, London, has changed a lot. People refer to Elephant and Castle as to one of the trendy places to live in London due to a lot of new builds, hipster places and a lot of development. Some people even call E&C the Shoreditch of 2010. The reason for that is a massive 3 bln redevelopment of the district, demolition of some social estates including famous Heygate Estate, that was even featured in some movies, and, finally, the opening of some pretty nice places, like Elephant and Castle Boxpark. In 2019, the shopping street with plenty of coffee places and bars will open just next to the Heygate street. There is also a brand new park and overall, a lot of investment going on. People bought flats in Elephant & Castle for £130,000 some 10 years ago and now the same flats cost no less than £400,000. All that makes Elephant and Castle a very appealing zone to move in and/or to invest in. The new houses that were built as part of Elephant Park (and are still being built) have really changed the face of Elephant & Castle, as well as One the Elephant Tower. It looks fancy and modern (however, it still looks a bit like it doesn’t belong there). Right now, Elephant and Castle represents a huge mix of people from all around the world, and well, at no point I felt in danger in the heart of Elephant & Castle. Of course, I didn’t spend hours under the bridge looking for trouble, but if you’re a normal person walking home from work or from a meeting with friends, then you should be fine! I filmed a small tour around the district for you: as you can see, it still looks a bit rough and it’s probably not the cleanest district in London, however, you can just watch this video and decide for yourself, whether you would enjoy living in Elephant and Castle or not. So well, is Elephant and Castle dangerous? The answer is no, it’s not very dangerous. However, just like in any big city, you need to be cautious and careful and you will be fine! However, I must say that there is still crime in Elephant and Castle and I know people, including myself, who were victims of this crime. Two of our neighbours were mugged on the street (their watches and wallets were stolen – with the knife near the throat) and I sold my iPhone to a friendly-looking Caribbean guy who paid me with fake money. There are still sketchy zones around Elephant & Castle, especially all the way down the Walworth road after the Heygate street. The worst part is probably near the Argos and I wouldn’t recommend you walking there at night. Elephant and Castle still has a lot of poverty, crime and inequality. When I was living there, it was nearly impossible to find a Christmas tree and the district wasn’t decorated for Christmas at all. There was no Christmas feel or atmosphere either. Many of the shops in the area were also very niche – Caribbean and Latin American (even Tesco to my surprise), so I was mostly bringing food from Angel, where I work. 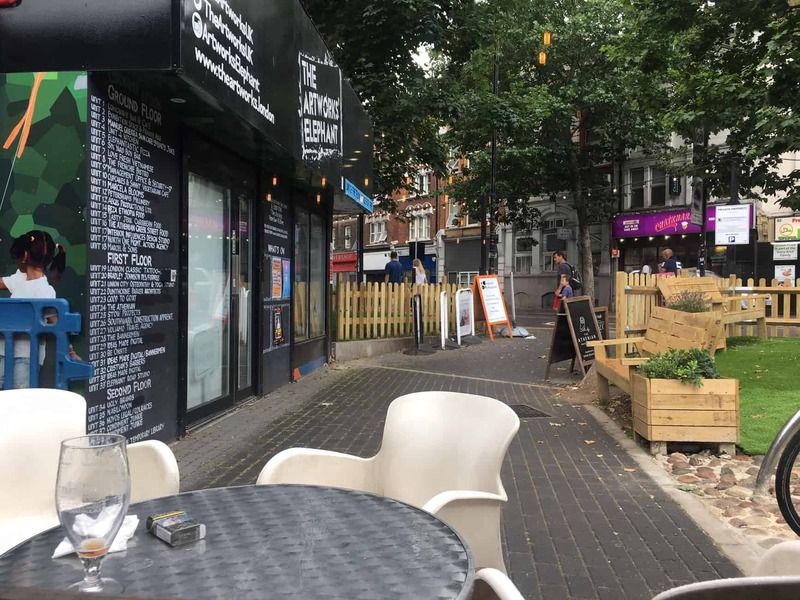 On the positive side, there are plenty of things to do in Elephant & Castle now: if you’re interested – head to this post about the best things to do in Elephant & Castle, where I talk about the most popular restaurants, coolest cafes and new openings! Are you planning to move to the UK? Read this post! Also, if you watched my video and realised that Elephant & Castle is not your cup of tea, that’s completely fine. In this post, you will find plenty of options where to live in London on any budget. Head to the post about the best places to live in London! Liked this article “Living in Elephant and Castle London – is Elephant and Castle dangerous?” Share it on Social Media!